@kortina reminded me a while ago, that it paid to learn shortcuts. To that end, I recently mentioned that I had become much more productive by mapping ⇧⌘] and ⇧⌘[ consistently as “Next Tab” / “Previous Tab” shortcut keys across all apps I use. If you were not aware, OSX has a built in way to set a custom shortcut (or override a shortcut) for any menu item. This means that for any application that has a “Next Tab” / “Previous Tab” menu item, you can assign the same shortcut keys. These shortcuts are already the default in Firefox and Terminal, and I’ve added them in Chrome, Adium and Textmate, which rounds out the applications I spend 95% of my time in. 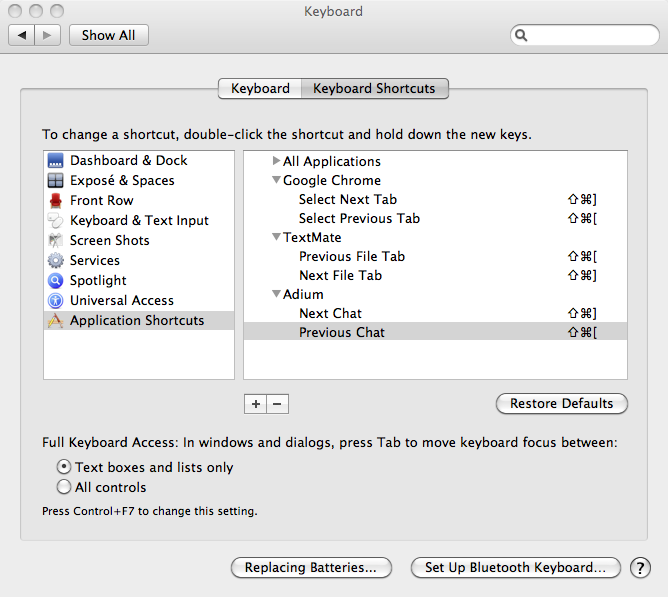 Update 2010/11/13: Textmate Rev 1.5.10 changes the default keys for next/previous tab to ⇧⌘] and ⇧⌘[.